Vancouver, Canada – Mawson Resources Limited (“Mawson”) or (the “Company”) (TSX:MAW) (Frankfurt:MXR) (PINKSHEETS: MWSNF) announces drill results from the first four diamond drill holes from the 2016-17 winter program at the Company’s 100% owned Rompas-Rajapalot Project in Northern Finland. Two rigs continue to drill at site 24/7, and subject to permitting, two additional rigs will be mobilized to site from early to mid-March. 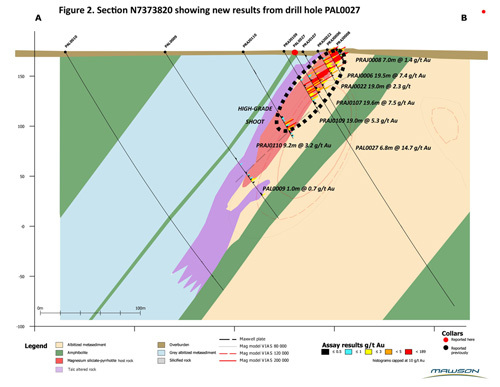 PAL0027 (3.6 metres @ 2.5 g/t gold from 27.5 metres; plus 6.8 metres @ 14.7 g/t gold from 34.4 metres; plus 3.0 metres @ 3.2 g/t gold from 44.2 metres;) is the first drill test into the high-grade Palokas Prospect using large diameter core, and encouragingly confirms grades found in earlier 25mm Winkie drill holes.PAL0027 was drilled between the 20 metre spaced PRAJ0107 (19.6m @ 7.5 g/t gold from 18.1 metres) and PRAJ0109 (19.0 metres @ 5.3 g/t gold from 38.7 metres) and has provided the first reliable orientation of gold bearing structures. PAL0028 (1.0 metre @ 0.8 g/t gold from 21.7 metres; plus 1.7 metres @ 3.9 g/t gold from 37.6 metres) and PAL0029 (1.0 metre @ 0.7 g/t gold from 95.65 metres), drilled 120 metres up dip and 50 metres north of PLA0030 respectively (Figure 1).Both holes intersected thin zones of gold mineralization, and provide evidence of the fault and fold structures which control the distribution the mineralized rock. PAL0030 (10.0 metres @ 11.6 g/t gold from 110.2 metres; plus 2.9 metres @ 1.0 g/t gold from 135.7 metres; 3.0 metres @ 5.3 g/t gold from 143.9 metres) was collared 150 metres northwest from the “discovery outcrop” at Palokas to test the down-plunge extension of an interpreted high grade gold-shoot within a moderately west-dipping surface. This high-grade intercept is the high grade-width intersection at Rajapalot, and confirms the shoot interpretation, which remains open at depth.This will be a high priority target for follow up drilling. 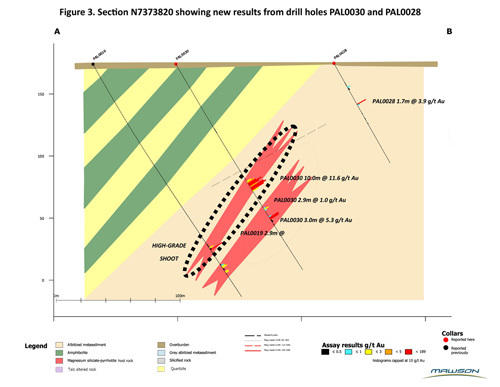 Plan, cross and longitudinal views of the drill results are shown in Figures 1, 2,3 and 4.Tables 1, 2 and 3 include all relevant collar and assay information. The true thickness of the mineralized interval is interpreted to be approximately 90% of the sampled thickness. Drilling with two diamond rigs is ongoing over an 1,850 metre strike throughout the Rajapalot area to test earlier shallow drillhole results, the source of extensive gold-bearing boulder trains, geophysical anomalies and the recent high quality base of till results (Mawson Press Release, Feb 9, 2017).To date, 10 diamond drill holes have been completed, with one hole in progress for 2,117 metres (Table 2).Drilling will continue until the snow break-up during April. Given the success of drilling and the broad and systematic anomalism from the base of till results, two further diamond drill rigs will be added to the program in March. The mineralized system at Palokas is hosted by a greater than 20 metre thick, magnesium- and iron-enriched, pyrrhotite-bearing isoclinally folded metasedimentary sequence that is sub-planar at the prospect scale, dipping approximately 45 degrees to the west-northwest. Although the host rocks are isoclinally folded and metamorphosed to amphibolite facies, the mineralization appears controlled by a series of late brittle structures, represented in drill core by quartz and quartz-pyrrhotite-tourmaline (+/- molybdenite, gold) veins. Retrograde alteration of the host package to chlorite is one of the dominant characters of the margins of quartz veins. Reaction of reduced gold-bearing hydrothermal fluids with iron- and magnesium-rich rocks is the most likely mechanism to precipitate the gold. Folding and minor faulting of the host sequence, in addition to the abundance of controlling quartz veins are all under study to aid in the successful targeting of later drill holes. 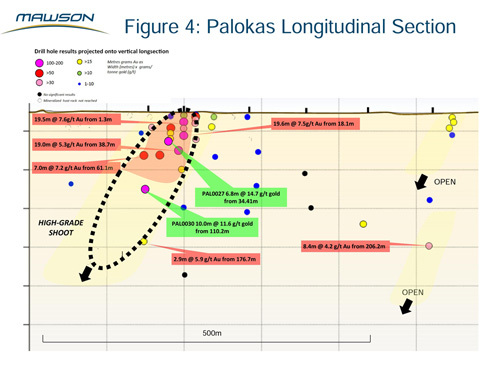 Metallurgical tests on Palokas drill core have demonstrated excellent gold extraction of between 95% and 99% (average 97%) (see Mawson Press Release October 28 2014). Mawson, in conjunction with all environmental authorities, has completed and will continue biological baseline mapping of all areas where drilling and access will take place. The Company minimizes its environmental footprint when using larger equipment by drilling in winter on snow cover and captures drill cuttings returned to the surface in Natura 2000 areas. Two diamond drill rigs (K1 & K2) from the Arctic Drilling Company OY (ADC) with water recirculation and drill cuttings collection systems were used for the drill program. Core diameter is NQ2 (50.6 mm) diameter core. Core recoveries were excellent and average close to 100% in fresh rock. 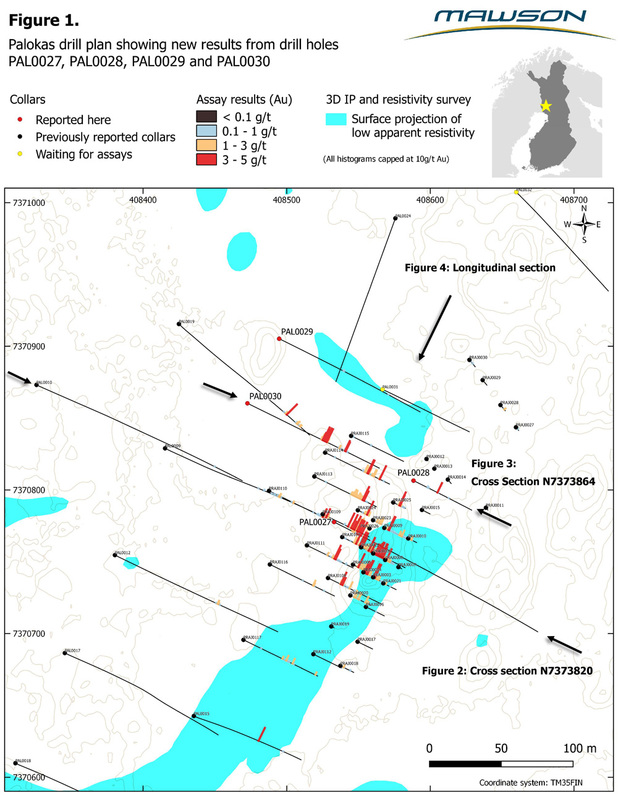 After photographing and logging inMawson’sRovaniemifacilities, core intervals averaging 1 metre in length for mineralized samples and 2 metres for barren samples were cut in half at the Geological Survey of Finland (GTK) core facilities in Rovaniemi, Finland. The remaining half core is retained for verification and reference purposes. Analytical samples were transported by Mawson personnel or commercial transport from site to the CRS Limited facility in Kempele, Finland. Samples were prepared at Kempele and analyzed for gold at Raahe using the PAL1000 technique which involves grinding the sample in steel pots with abrasive media in the presence of cyanide, followed by measuring the gold in solution with flame AAS equipment. The QA/QC program of Mawson consists of the systematic insertion of certified standards of known gold content, and blanks the within interpreted mineralized rock. In addition, CRS inserts blanks and standards into the analytical process.